At an education event held in Chicago, Apple has unveiled its newest iPad to date poised to compete with the abundance of Chromebooks found in schools. The latest rendition features a 9.7-inch display with an A10 Fusion chip. Weighing in at one pound, the new iPad is as light as ever. Despite Apple's push for Face ID on the iPhone X, a Touch ID fingerprint reader remains a part of the home button. A rear facing 8-megapixel camera is carried over from the 2017 model as is the front facing HD camera for FaceTime. Augmented reality applications will utilize camera information to virtually place objects in classrooms, much like Google's Expeditions AR. Battery life is good for up to 10 hours of standard use. An optional LTE radio provides up to 300 Mbps download over cellular networks. GPS, compass, gyroscope, and Bluetooth remain standard features. 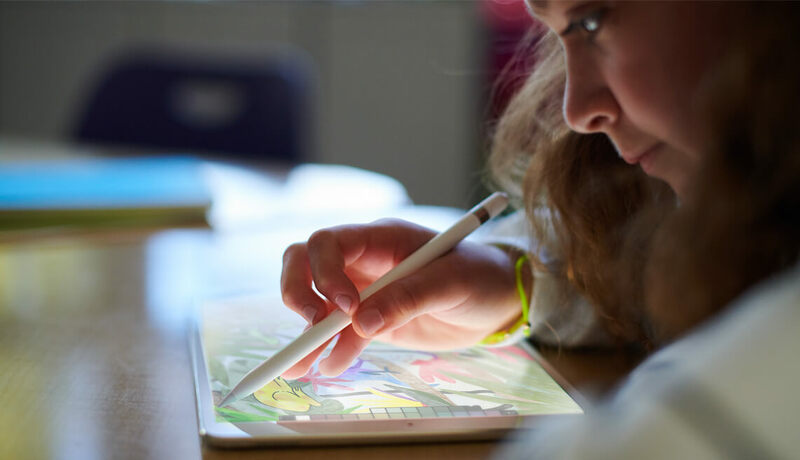 The largest change is support for the Apple Pencil. Users are able to mark up documents and create drawings with the pressure-sensitive stylus. Palm rejection technology allows you to rest your hand on the display while still being able to use the stylus. Additionally, there is a third-party stylus by Logitech called the Crayon available for $49 meant for kids. As part of Apple's focus on education, students will receive 200GB of free iCloud storage. Both Wi-Fi only and LTE models will ship with 32GB of built-in storage. Priced at $329 for regular consumers and $299 for schools, this is a regular incremental update from last year. However, improved software features and stylus support do bring significant advantages to educators. The 2018 9.7-inch iPad is available today and will ship later this week.